Carrots are one of the most loved vegetables. When I ask new gardeners what they want to grow, carrots are usually top of the list. The only problem is that they are a bit tricky to grow. When I began gardening, I couldn't get carrots right. I finally tried a bunch of different methods and developed the one that I now use. It always works and now carrots are easy and reliable. First, you need the right carrot for your soil. 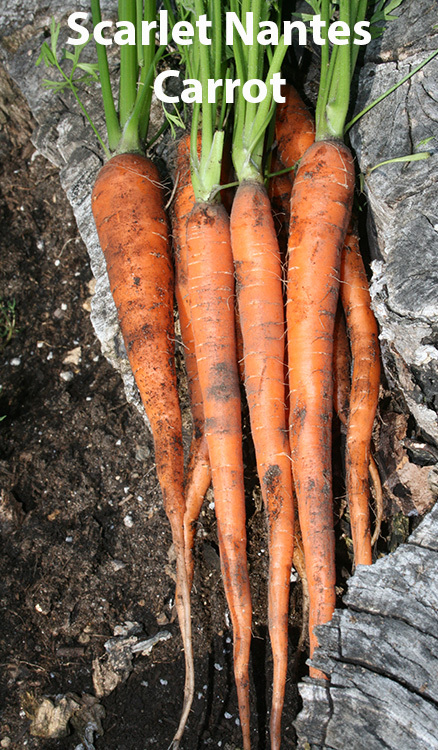 Carrots require a loose soil for the roots to form properly. If the soil is too dense, they can't form a nice root, but will split and curl and look deformed instead of a nice, straight root. There are many different carrot varieties, ranging from very short to very long carrots. 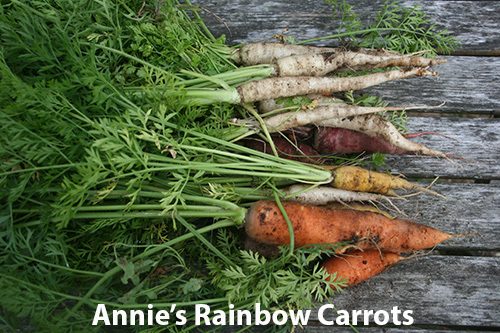 If you have dense soil, you will want to pick a shorter carrot. 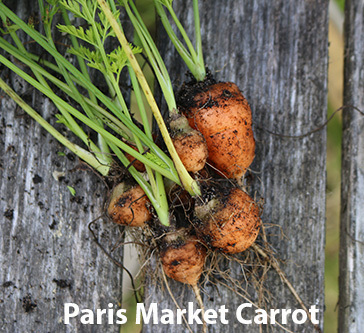 The shortest carrot we have is Paris Market, which is about a 1-2 inch round ball. 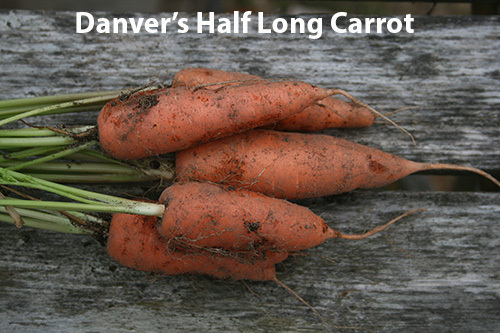 Danver's Half-Long is a good choice if you can grow a 5-6 inch carrot. 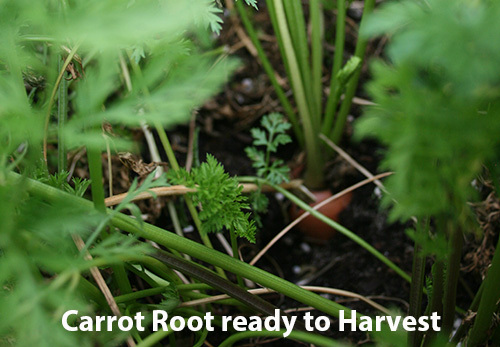 If you have light and loose soil, especially sandy soil, then you can grow any carrot, including the long Scarlet Nantes and St. Valery carrots. Second, carrots take a long time to germinate. They can take 2-3 weeks to germinate, and in that time they need to be watered daily. If the carrots dry out for too long during the germination period, they can die and never sprout. There is nothing more frustrating than watching your carrots not come up. You keep waiting and waiting and nothing happens. This is especially true if you have sandy soil. It drains quickly and the seeds dry out easily. Regular watering solves this problem. Before planting, make sure you thoroughly weed the garden bed. Since carrots take so long to germinate, you want to be sure that there aren't a lot of weeds coming up. It can be difficult to tell what is a carrot and what is a weed, and you don't want to accidentally pull out all your carrots! I like to plant carrots in closely spaced rows. If I am using a drip irrigation tape, I plant seeds on both sides of the tape. I usually space rows about 4 inches apart. A carrot bed will have 6-8 rows of carrots in it. I usually make a row with a hoe or my finger. I make a small trough and lightly scatter seeds in the trough. 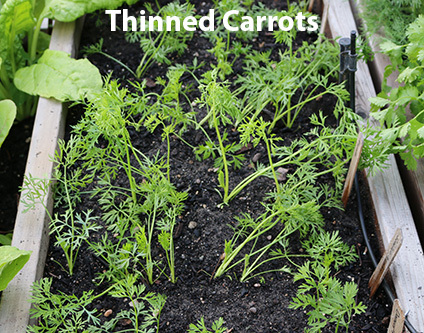 You don't want to scatter them densely because it will be hard to thin when the carrots come up. 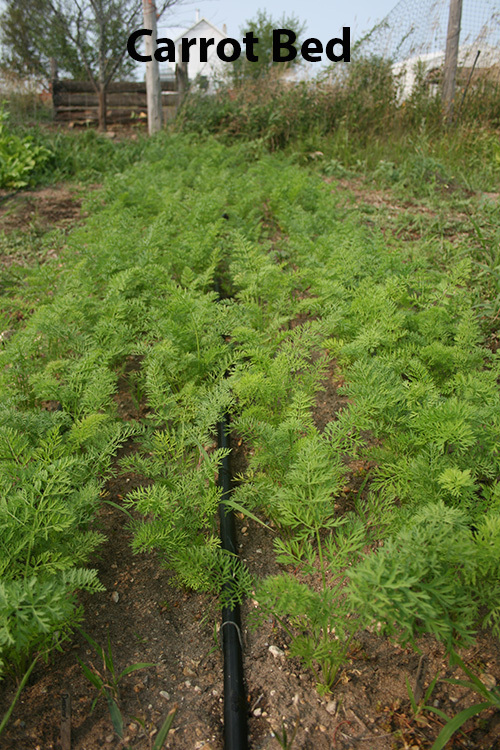 The eventual goal is to have carrots spaced about 2 inches apart in the rows. Once I scatter the seeds, I lightly run my finger down the trough. Don't cover the seeds. Carrots don't like to be planted deep. When you run your finger down the trough the seeds will gently fall under a bit of soil. That's deep enough. I like planting the carrots in the troughs because the troughs help mark where the carrots are planted. When your carrots come up, it is nice to know where to expect them and it helps identify what is a carrot and what is a weed. Some people plant a few radishes in the carrot rows to help mark the rows. Radishes come up quickly, so you'll definitely know where the rows are. I don't like to do this because our family doesn't really like radishes that much and that means I end up disturbing the carrots when I pull out the radishes. But if you love radishes then this is an option. I like to thin my carrots once the tops are about 4-6 inches tall. I gently pull out all the extra seedlings. I like to have the final spacing around 1-2 inches depending on the final size of the carrot. If I'm growing mini-carrots like young Little Fingers or Amsterdam Forcing, then I will thin to 1 inch spacing, but if I'm growing a larger carrot like St. Valery, then I will thin to 2-3 inches between carrots. Carrots are ready to harvest when they are the size you want and flavor you want. Little Fingers can be harvested as baby carrots, so you can harvest any time the root is to the size you want. Other carrots may not develop their full flavor until they mature. To test for this, you can gently remove a carrot and try it and see if it has a lot of carrot flavor. Usually you have plenty of carrots planted, so trying one isn't making a huge dent in your harvest. To harvest a carrot, uncover the top of the carrot by brushing the soil away. If your soil is loose, you can gently wiggle the top of the carrot and pull it out. If your soil is dense or the carrot is really long and it isn't releasing, then you'll have to loosen the soil around the carrot to pull it out. If you just tug, then the root can snap off half way down and you'll only get half of your carrot. To loose the soil, I like to use a pitch fork. I carefully push the tines of the fork into the soil next to the carrot row. If you insert it in the soil too close to your row or on an angle into your row, you will stab carrots and pierce them. After I have the fork in, I use it to loosen up the soil under and around the carrot row. Then I can usually pull out the carrots. Carrot store in the garden for quite a while. Once they are ready to harvest you don't need to pull them out of the ground right away. They will usually store until the following spring before going to seed, so you don't have to harvest them until fall. I like to harvest them as we eat them, so we always have fresh carrots to eat throughout the fall. They then store a long time in the fridge, so in the fall I harvest them and put them in the fridge and we eat carrots from the garden well into winter.